It arrives Monday, and a top chef shared recipes for foods traditionally eaten to mark the occasion, on The Early Show. The Chinese New Year arrives Monday. It's the year of the Ox. On The Early Show Friday, viewers got a taste of the new year and some dishes traditionally enjoyed to celebrate it from Chris Cheung, executive chef at New York's China 1 restaurant, where he turns out turning out modern, innovative takes on Chinese cuisine. Cheung also brought along a noodle maker, Kam Chung Chan, who demonstrated how dough is stretched and shaped to produce Chinese noodles. The Chinese New Year is always celebrated by dinner with family, often both the night before and night of the holiday. Family members exchange red envelopes, typically filled with cash, to bring good fortune in the new year. There are 12 different animals in the Zodiac; Chinese tradition says these were the first 12 animals to help Buddha in his time of need. Many say the Ox is the sign of prosperity through fortitude and hard work. President Obama was born in the year of the Ox. 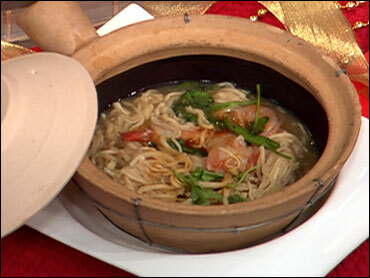 The noodle dish Chef Cheung made is a very simple broth in which he quickly cooks noodles, shrimp, spinach or watercress, and an ingredient called fat choy. Fat Choy is a tree root that's available at any Chinese market this time of year. It means good luck, and is served in many soups for the new year. Noodles represent longevity and long life. The word for the shrimp in Chinese is the same word used for smile, so shrimp tends to represent happiness in the new year. Heat chicken stock to a simmer. Add the wine, soy and sugar, bring to a boil. Add the noodles, then add the shrimp and fat choy. Pour into a large soup bowl and add the ginger, cilantro and scallion. Mix potato w/ flour, and pan fry to a crispy lattice. Heat a pan with vegetable oil, add all the vegetables except for the tofu and bean sprout. Add the glass noodles, water, let it cook for a minute, then add the soy and sugar. Toss, add the bean sprout and tofu, toss lightly, and place on top of the lattice potato. Drizzle the sesame oil and sprinkle the ginger over all. Garnish with the scallions and cilantro. Rinse chicken, and submerge it in the chicken stock. Remove chicken and simmer stock. Put chicken back in stock and simmer untill the chicken is 145 degrees. Combine vinegar and honey, heat just to dissolve the honey. Dip the chicken in the vinegar mix. Let chicken cool; at this point you can keep the chicken in the refrigerator for one day. Roast chicken at 450 degree untill golden brown. Toast salt in a dry pan untill it turns off-white. Place chicken on a plate and garnish with the lemon. Serve with the salt to season. Squeeze lemon on chicken and eat with salt to taste. Mix all together to form a dough. Roll out dough, cut circles with a 3-inch ring mold. Place filling in center of circle, fold dough over filling to form a half moon, and press around edges to seal dumpling. Place dumplings in a hot oiled pan, and brown one side. Drain oil and add water so it covers ¼ of the dumpling. Cover pan. Remove dumpling when water evaporates.